I have been involved with and enjoyed Great Danes for many years now. I've owned many breeds of dogs before, an Akita, Basset Hounds, a Doberman, Old English Sheepdogs and a few others growing up, but the Great Dane is the one I will never be without again. I am hooked; they are my passion that I will enjoy sharing with others. Harlequins are the color of Great Dane that appeal to and inspire me the most, especially the old BMW lines produced by Laura Kiaulenas. I was bitten by the "Show Bug" learning the ropes from the ever patient Marni Kueber of Dark Horse Danes along with advice and guidance from many others along the way. All the people who have become what I affectionately refer to as my "Dog Friends". Moving back to my roots of obedience as well as learning new things in Rally-O proved to be fun and rewarding. I look forward to trying our hand and paws in many new, fun and competitive dog activities such as barn hunt or chase ability. I enjoyed visiting the Stollery Children's Hospital in Edmonton many times with my Dane Levi (Certified Therapy Dog), who was an amazing ambassador for the breed. A life enjoyed with a dog is definitely enriched. I have been a member of the Canadian Kennel Club for over 10 years. I am a member of the Great Dane Club of Canada, having been the Director for Alberta for the 2014 and 2015 term. My dogs are family first and live with us in our home as part of our everyday lives, as I will expect for any puppies I produce. 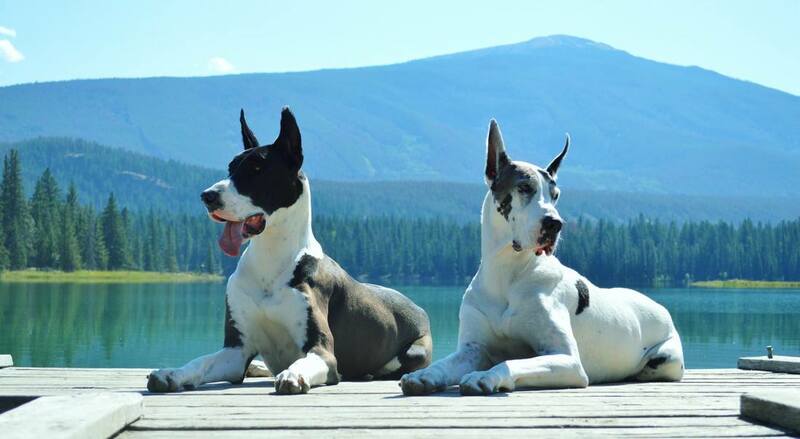 All of my Danes must be a minimum of two years of age and have all breed appropriate health tests completed before I will consider breeding them. My focus will be on producing quality Great Danes with correct, sound structure and substance. Athletic working dogs with good health, longevity, intelligence, breed type and the sweet temperament that Great Danes are known for. The breed standard, advice of long time breeders, knowledge of up to date research, pedigree research and decisions made to improve each time a litter is produced will be my guideposts. Moral and ethical decisions will always be my foundation. A good breeder can do their part, but a puppy must have a stable home and leader as well as proper nutrition, exercise and training to become the GREAT dog and family member you want.